There’s an awesome organic grocer near our place called Ecollegey. 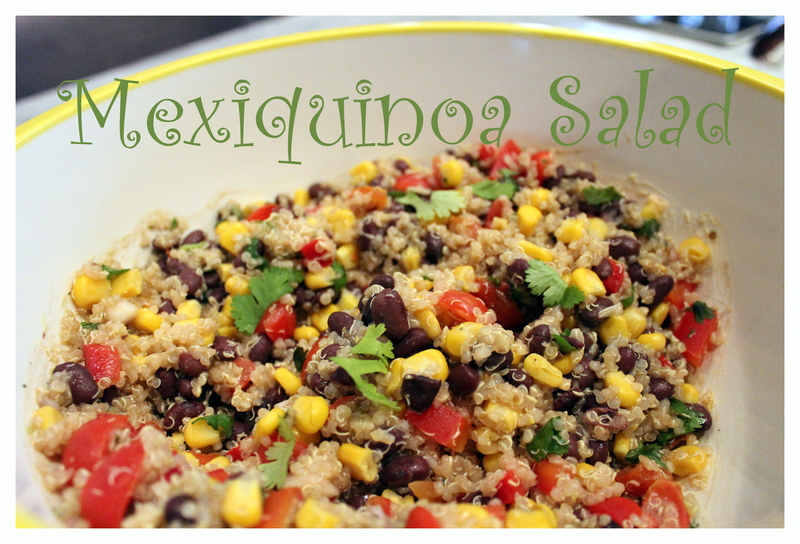 Their kitchen makes many delicious prepared foods, among them is their Mexiquinoa Salad. Here is my take on this meal-in-a-bowl. Prepare the dressing by mixing together the lemon juice, olive oil, cumin and salt and pepper. Place all other ingredients in a large salad bowl and toss gently with the dressing. Season with additional S&P if needed. This meal comes together in as little as 25 minutes, making it weeknight approved in my books. Get organized by starting your quinoa right away, then prep your veggies while it cooks. As soon as the quinoa is done, transfer to a heat safe bowl and pop it in the fridge to a) prevent it from over-cooking and b) to speed up the cooling process. We actually love eating this salad while it’s still slightly warm so don’t be afraid to jump right in. This entry was tagged toddler, Vegan, Vegetarian, weeknight. Bookmark the permalink. Thanks for the comment. It feels good to be back!